My daughter is not giving me a hard time, she is having a hard time. And even if I feel like she IS giving me a hard time, it is important for me to realise that my hard time comes from my own insecurities and triggers from my past. They are my feelings to own and deal with. I am the adult and I must take responsibility for how I handle those feelings. I am sure if I could remember back to my four year old self, I would remember the confusion, the frustration, the jealousy, the feeling that nobody understood, the lonely feelings and the sad ones. I think I would also remember that the hurts I felt were real and mine to feel. They were not for someone else to own and reciprocate nor were they fabricated to give my parents a hard time. They simply were what they were and all I would have wanted was for someone to get me, to see me and to understand me. I am now beginning to realise that when I let myself become affected by her behaviour and begin to believe that my hard time is harder than her hard time, I am no longer being the respectful parent I am aiming to be. My reactions become intolerant and unempathetic. The effects of these reactions for my beautiful, sensitive girl are long lasting. Miss 4 became upset recently after seeing her younger sister, receive a colourful new mattress protector. She didn’t show her reaction directly upon seeing the liner, in fact she ogled over it and admired the beautiful design. About 2 minutes after seeing it, Miss 4’s behaviour became erratic and unpredictable. She swiped a car her sister was offering her out of her hand and shouted that she did NOT want to play with her. Now, if I was not parenting objectively here, not seeing the bigger picture and not seeking to understand the hard time my daughter was having, it could have been easy to run to the defense of Miss 3, and to see the aggressive acts from Miss 4 simply as poor behaviour. Her hard time could have become lost in translation as I sought to discipline her and teach her that Miss 3 was trying to be kind so it was not nice to treat her that way. Instead, I sat with her as she was curled up screaming under her sister’s bed. She yelled for me to go away. I told her that I would go away if that’s what she wanted but that I still loved her no matter what. My daughter is not giving me a hard time, she is having a hard time! As it turned out, Daddy had not said this to her, we have never used naughty to describe our children’s behaviour. But it made me realise that this is probably how she perceived herself at that moment. She knows what the word means and in her own mind she had convinced herself that this was how we viewed her. Every time we react to her behaviour with exasperation as though she is giving us a hard time, we are sending her the message that we think she is naughty or there is something wrong with her, without needing to use those words. Every raised voice, loud sigh, stern word or cold shoulder is absorbed and swallowed by our little girl to be carried around with her throughout her days. A vague memory stirred. The Stradbroke Island trip was over 8 months earlier and I seemed to remember having a stressful, emotion charge moment with Miss 4 where she was hitting at me, trying to bite me and shouting that I would never ever be her best friend. In a moment of parenting thoughtlessness I had told her that that was okay; that I didn’t want to be her best friend. In hindsight, it was an awful and immature thing to say to a child having a hard time and needing love and acceptance. I had believed in that moment that I was being given a hard time and I was triggered. In my view, my hard time was more important than hers and my reactions came accordingly. Now, here she was, 8 months later, still holding onto that pain she had felt back then. I am grateful, though. I am grateful that she has finally been able to verbalise these feelings. She has let us in on a little part of what is happening inside her, each time she snaps seemingly out of the blue. She carries with her so many emotions. Her outbursts seem out of the blue because despite outward appearances she is is actually self regulating her emotions most of the day. The feelings are always there, simmering, but she covers them up through cleverly masked disguises. I often say to people she seems to go from 0 to 100 in 0.5 seconds flat. But what I am now realising is that she more likely sits on 95 for much of her day, covering this up very well and then reaches 100, very quickly, screaming in rage when she can no longer hold it in. As Miss 4 sobbed into my arms that day, I was able to deeply apologise and reassure her that my love for her was strong. I told her of all the qualities I loved about her. Her generosity, her kindness, her strength, her determination, her adventurousness, her ideas, her assertiveness, her helpfulness, her loving spirit, her zest for life, her confidence and bravery. I genuinely admire these things in her but I don’t get to tell her enough. She cried out “Yeeeeeeeeeesssssss!” as if I had finally got it. I told her I get it. I told her I understood and it was normal to feel that way. I empathised that I had felt that way about my younger sister when I was little. I told her I couldn’t make her sister go away and that I loved her too but I reminded Miss 4 that I was there for her and would always help her whenever she needed it. I also pointed out that my sister and I eventually had lots of fun together and are now best friends. Her arms were wrapped around me but she clawed her fingers deeper around my back, trying to squeeze a little harder, not wanting to let go. I didn’t make her. At those times, when my daughter is playing up, acting out or expressing emotion, I have to stop seeing these behaviours as personal threats against me and my sanity. She is not seeking to derail me. She does not want me to fall to bits on her. She does not want me to see her as naughty. She can’t cope if I can’t cope with her. It is not always about food or sleep. She is trying to tell me something; something important. Her hard time is harder than my hard time. My Daughter is not giving me a hard time she is having a hard time! This entry was posted in Expressing Emotion, Parenting Peacefully and tagged Acknowledging Feelings, having a hard time, jealousy, Respectful Parenting on June 2, 2015 by peacefulparentsconfidentkids. Thank you from the bottom of my heart for this. I’ve been feeling like my almost 4-year old is giving me a hard time lately, and I haven’t always been handling it well. I thought that by keeping it together I could shield him from everything that is going on in our family, but that’s an illusion. The blinders just came off. He is having such a hard time! I’m going to print your ‘I must remember’ and read it over and over so I don’t forget. Thanks again for sharing your struggles candidly, it is so helpful! You’re most welcome, Steph! I’m sorry to hear you’ve been having a hard time lately. I truly hope you are able to reach out to your son and find that connection you need. Please sing out if I can help in any way. Thank you, Kate! Yes, so so easy to take those hard behaviours to heart. I constantly have to remind myself to think about her needs before reacting with my needs. I have the poster in the article, pinned by my work area to remind myself! SO important to try and remember this perspective!!!!!!! I read this soon after you first published it and it has been on my mind ever since. I never really thought to of it this way and it has totally changed how I see her struggles. Thank you so much! You’re so welcome, Kate. I’m really pleased that you were able to take something from this that might help you and your family. Such a great post! I was telling myself this just last week, my 8 month old has a cold and was teeth, she was screaming and cranky all day. I was tearing my hair out but I just kept reminding myself she was feeling so much worse than me and it made me just want to help her. I know its different with a baby and a young child, but they all have needs and its our job to understand and help. You sound like a wonderful mother and its so wonderful you sat down and talked to your daughter about what was bothering her, this is how strong relationships are built! Thank you so much, Luisa. Babies are a different ball game to toddlers for sure but definitely no easier. It sounds like you did a great job being supportive of your daughter’s needs when she was struggling. I think we can both look forward to those beautifully strong relationships with our children. Love this post! I’m going to share it on my Facebook fan page with all the ADHD families that I know can identify and will really appreciate this message! I needed this today. I have a 5 year old daughter who struggles constantly with her strong emotions/reactions. It is exhausting and I know my reactions often only make things worse. I’m looking forward to reading more about your ideas on peaceful parenting and will keep your reminders close at hand. It really is exhausting, isn’t it, Lisa? Stay strong, you are a wonderful Mum! Sing out if I can help in anyway. Your honesty and clarity is something I could not articulate. Beautifully said. Love the emotions you shared. Thank you. Thank you so much, LuAnn! I wish you were my mom! I can’t begin to say how many times I was shushed or punished because I didn’t have the words (and capability) to express my true needs, thoughts, and insecurities as a child. It’s also great reading it now. 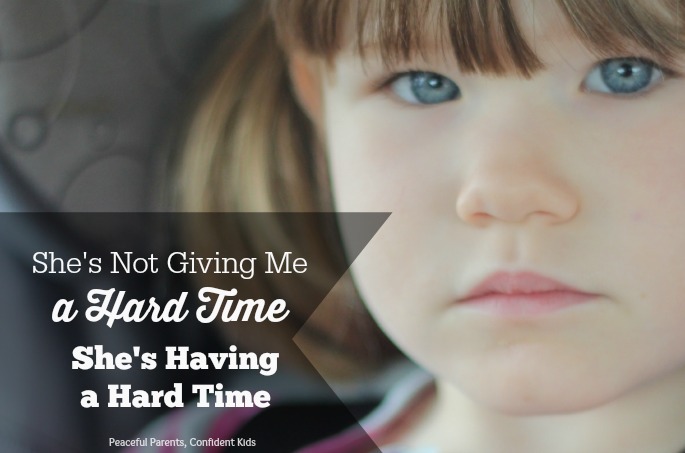 I’m going through a rough patch with my fiance and that mantra “he’s not giving me a hard time. He’s having a hard time” rings really true for me too. He’s really quiet and kind and kinda timid, but that also means that he can find me & the relationship etc unnervingly overwhelming. The opposite of your confidently, but somehow similar, because learning to express himself confidently and effectively in a way that would get him heard is an uphil struggle. I really related to your article and its encouraged and inspired me . Thank you. sounds like our 12year old. Pingback: Mama Reads Monday - Weight, Summer Challenges, & MORE! Thank you. A much needed reminder. Fabulous article really made me think. I needed this today! What a beautiful and clear point of view. Wonderfully written.